Kevin Johnson, planner in the City of Pasadena’s Design and Historic Preservation section, will speak at La Casita del Arroyo on a remarkable project, the Study of Historic Designed Gardens in Pasadena, thought to be the only survey of its kind in the country. For more on the project click here. 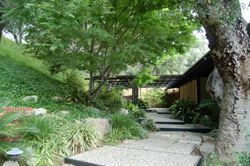 Pasadena’s rich garden history spans the work of great American landscape architects from the Olmsted Brothers to Lawrence Halprin.